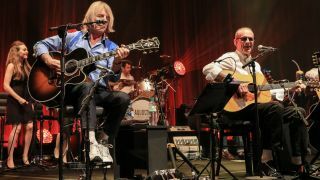 Status Quo have revealed that they’ll launch their second acoustic album later this year. The follow-up to 2014’s Aquostic (Stripped Bare) will be titled Aquostic II – That’s A Fact! and will be released on October 21 via Universal Music On Demand. The band have made the artwork and tracklist available to view. See them below. Aquostic II – That’s A Fact! will be issued on on CD, limited edition double vinyl and deluxe 25 track edition 2CD. The standard CD release features 12 reimagined Quo tracks along with new tracks One For The Road and One Of Everything. The deluxe edition comes with a second disc which features six tracks recorded at the band’s Stuttgart Aquostic show 2014 and another new track, Is Someone Rocking Your Heart? Last month it was reported that Status Quo guitarist Rick Parfitt would make a full recovery following an “extremely life-threatening situation” he suffered in June. While he recuperates, he’s been replaced in the lineup for the band’s live commitments by Freddie Edwards – son of Quo bass player John ‘Rhino’ Edwards. Their Last Night Of The Electrics European tour continues on August 26, when the band play Taunton’s Vivary Park, in the UK. Is Someone Rocking Your Heart?